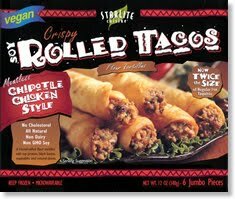 First up Chipotle Chicken Style rolled tacos from Starlite Cuisine. I picked these up last week because they looked good. I tried a few of the varieties before and liked them. Well, I really like these. The spicy 'chicken' is housed in a flour tortilla that bakes up crunchy. The kick is there - not to hot but nice. I love these served with guacamole and hot sauce! I bought Merry Hempster's Hot Muscle Rub last night because - I have cramps and my lower back hurts. I have an appointment for a massage this weekend but my back is so sore and I feel like a big cry baby. So I had Matt rub this all over my lower back last night and really like it. It smells like yummy gum - minty and warm and the heat it brings is nice and soothing. I was tempted to rub it over my whole body last night...I think I might do that now! We have that muscle rub, too, and Mike loves it for when his back is hurting (his job is very physically demanding). The rolled tacos sound yummy!